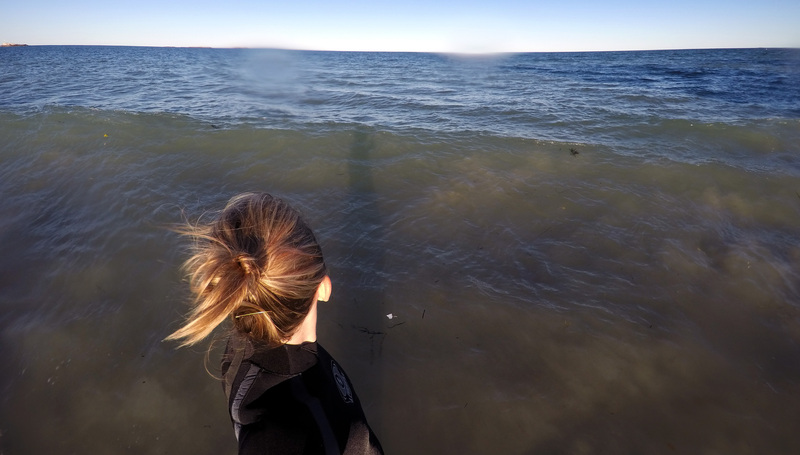 JHS in her wet suit on the MA coast shooting her next series, November, 2015. Jess Hurley Scott is a contemporary painter of land and seascapes. Her dimensional paintings of multiple layered, individually painted acrylic panels deal with light, illusion, and perception. Scott plays with the intricacies of the natural world, digital technology, and translucency in her work. The result is bold realism and a unique interpretation of landscape in paint and pane. Her scale ranges from near miniature scale vignettes to dramatic, sweeping seascapes. Born in New York in 1978, raised there and later outside of Boston, she started muraling as a teenager. Scott studied illustration at Syracuse University under Robert Dacey, Murray Tinkleman, Rodger DeMuth, and John Thompson where she received her BFA in 2000. After graduating, she lived in New York City and later Boston working as a designer for 14 years in home product ranging in materials from textiles, to metals, wood, and glass. This experience taught her how to build not only composition, but how to develop the frame and weave the canvas. At the Art Students League of New York, studying with Hugo Bastidas in 2003, she started experimenting with some of that knowledge and began painting on glass and later acrylic. Later in Boston, she further developed her technique to the dioramic panels that they are today. Scott has shown in various galleries and spaces in New York, Boston, Nantucket, Florida and throughout New England. She is a member of the American Society of Marine Artists and is a gallery artist at the South Shore Art Center, Cohasset, MA and the Cambridge Art Association, Cambridge, MA. She currently lives and works in Scituate, MA with her husband and daughter.